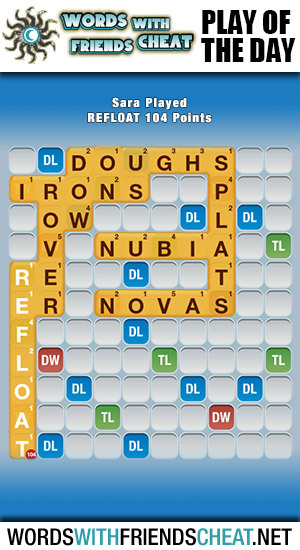 Today’s Words With Friends – Play Of The Day is REFLOAT (104pts) and was submitted by Words With Friends Cheat user Sara. Sara used a combination of good strategy and great placement to create a hard hitting 3-in-1 play. The main portion of her play spanned a triple word and two triple letters while her secondary words earned her some extra points. Sara decided it shouldn’t stop there and added some extra punch to her play by making sure to empty her entire rack. This activated a hefty thirty five point bonus. I prefer not to cheat to win, but I also prefer to win.